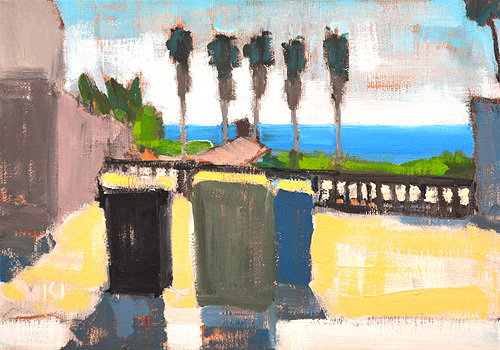 This entry was posted in Landscape Paintings, San Diego Paintings and tagged 5 x 7 inches, california, ocean beach, oil on linen on panel, san diego, trash can on June 2, 2016 by Kevin. 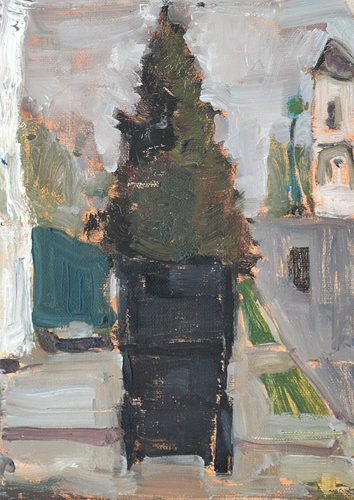 Painted this one year ago today. 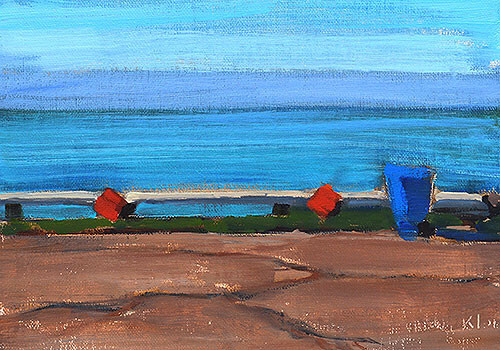 This entry was posted in Landscape Paintings, San Diego Paintings, Seascape Paintings and tagged 5 x 7 inches, california, landscape, OB, ocean beach, oil on linen on panel, san diego, seascape, trash can on December 30, 2014 by Kevin. Walked up 19th Street to the new coffee shop, which does not ever seem to be open. (And it wasn’t.) 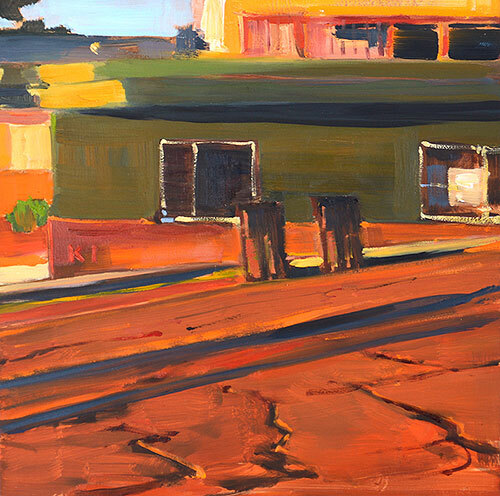 The evening light looked like Armageddon. 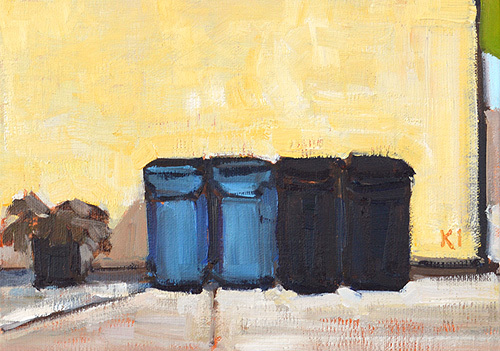 This entry was posted in Landscape Paintings, San Diego Paintings, Urban Landscapes and tagged 6 x 6 inches, california, city, market street, oil on panel, rubbish bin, san diego, sherman heights, trash can, urban on December 5, 2014 by Kevin. 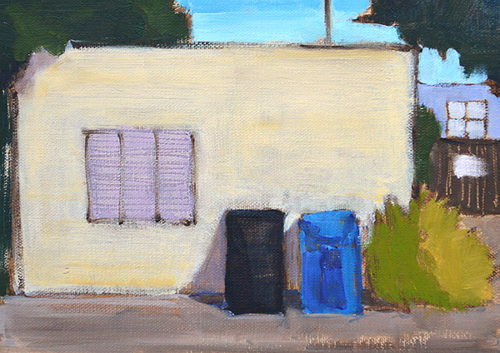 This entry was posted in Landscape Paintings, San Diego Paintings, Urban Landscapes and tagged 7 x 5 inches, california, oil on linen on panel, san diego, shadow, trash can, trash day on November 7, 2014 by Kevin. 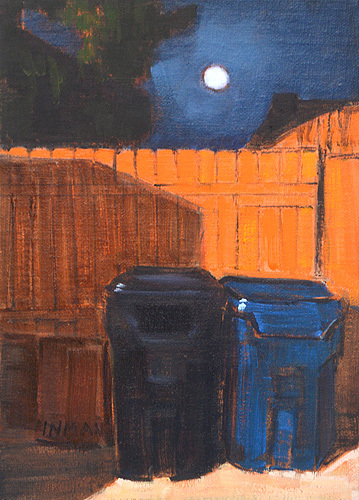 This entry was posted in Landscape Paintings, San Diego Paintings, Urban Landscapes and tagged 7 x 5 inches, california, night painting, nocturne, oil on linen on panel, san diego, trash can on October 22, 2014 by Kevin. 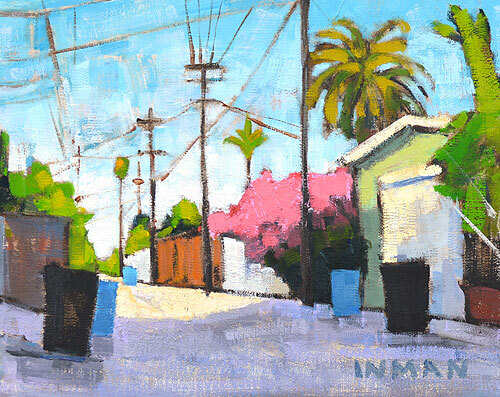 This entry was posted in Landscape Paintings, San Diego Paintings, Urban Landscapes and tagged 6 x 6 inches, alley, driveway, north park, palm tree, recycling bin, san diego, trash can on June 5, 2014 by Kevin. 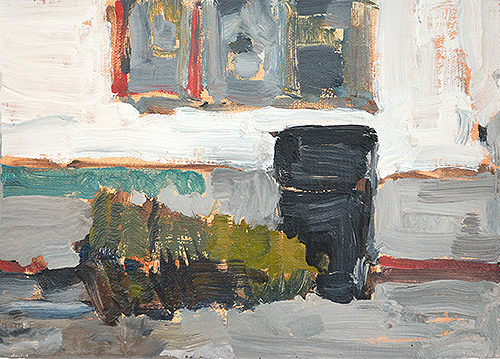 Maybe from the 1930s based on the pitch of the roof… my house is the exact same color (a color, I have been informed, is called Toasted Almond). 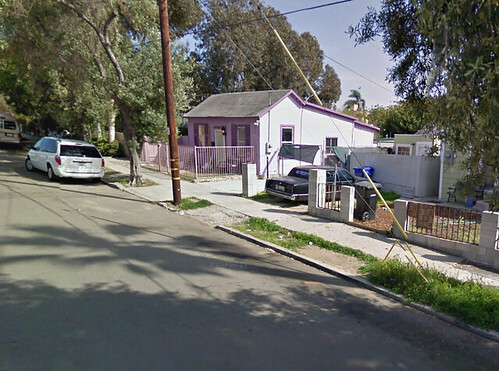 Though I was looking at Google Street View and my house used to be 2 shades of purple. 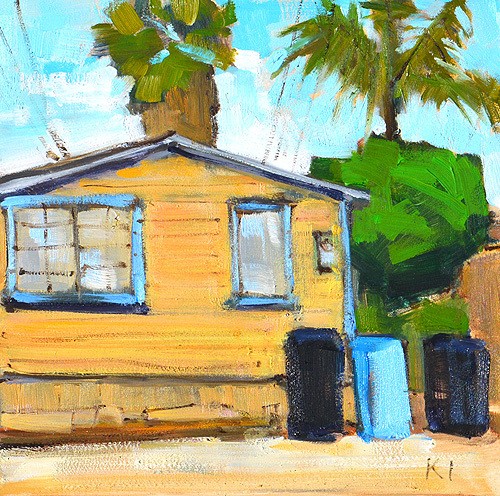 This entry was posted in Landscape Paintings, San Diego Paintings, Urban Landscapes and tagged 6 x 6 inches, alley, california, house, ocean beach, oil on panel, old, palm tree, recycling bin, san diego, trash can on May 21, 2014 by Kevin. 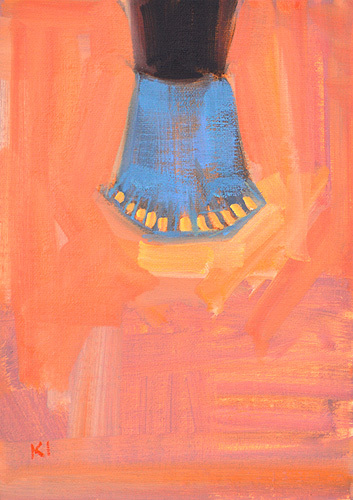 When I was a teenager we lived in Japan. This is behind the Japanese supermarket where I go to satisfy my unbearable nostalgic cravings for Pocari Sweat. 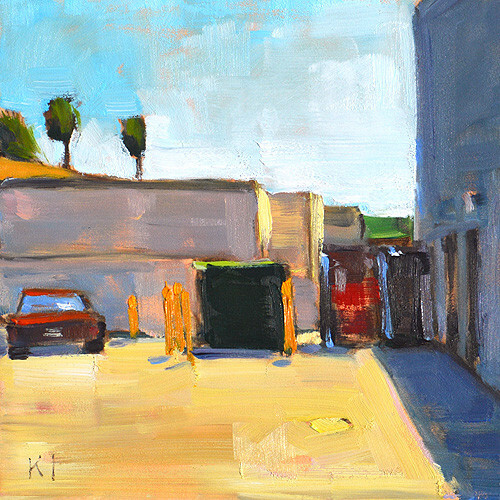 This entry was posted in Landscape Paintings, San Diego Paintings, Urban Landscapes and tagged 6 x 6 inches, alley, california, dumpster, landscape, marukai, oil on panel, parking lot, san diego, trash can, urban on May 9, 2014 by Kevin. 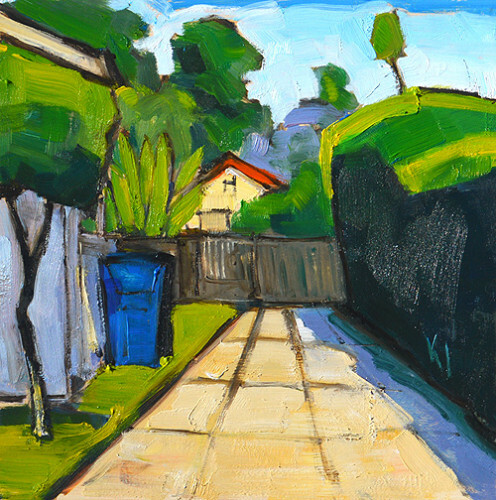 A peaceful alley on Trash Day in South Park, San Diego. 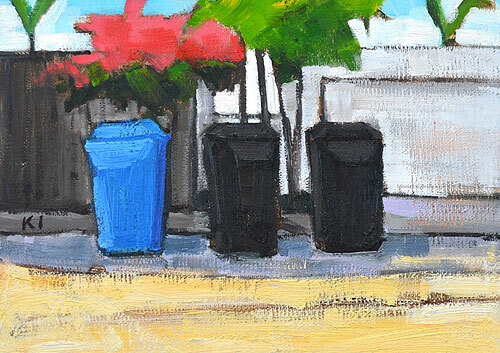 I like Trash Day, well I like it every two weeks when they collect recycling, because I think the blue recycling bins are pretty. 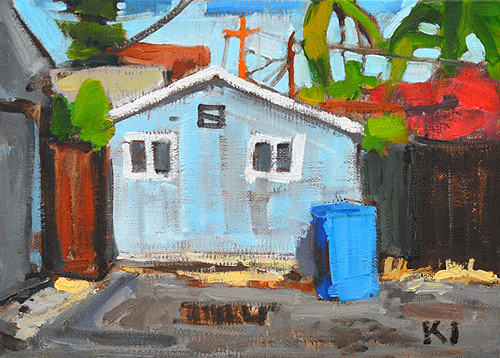 This entry was posted in Landscape Paintings, San Diego Paintings, Urban Landscapes and tagged 8 x 10 inches, alley, california, city, garage, landscape, oil on linen on panel, painting, palm tree, recycling bin, san diego, trash can, urban on February 19, 2014 by Kevin.